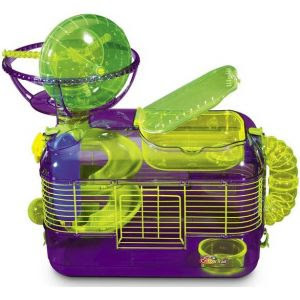 The folks at Pets International certainly have some wild imaginations, especially the creators of their beloved CritterTrail line of habitats and accessories for small animals. Take the CritterTrail X, for example. This wildly innovative hamster, gerbil or mouse cage is full of activity-driven amenities, like the Xtreme wheel (its ability to spin in both directions apparently earned it the "Xtreme" moniker). To access the wheel, your little buddy must first traverse the Spiral Slide, which is arguably much funner on the way down. There is also the "eXtractable" petting zone, a removable area of the habitat that can be used as a carrier during cleanings or simply to offer your pet a tasty treat and a little lovin'. 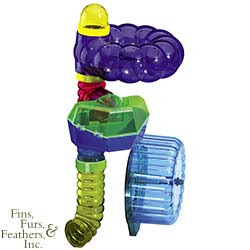 X also includes a "fun-nel" climbing tube, water bottle and food dish. Oh, and did I mention that this thing is glow-in-the-dark? Well, I did now! Perhaps best of all, CritterTrail habitats are expandable. So when your small animal grows into a not-as-small-as-he/she-used-to-be animal, you can remodel accordingly to ensure your pet lives a happy, healthy and productive life.